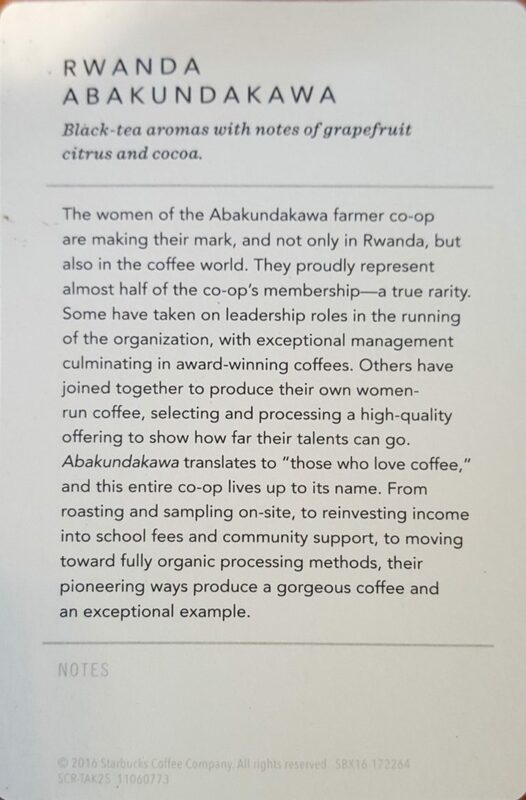 The new Rwanda Abakundakawa is the February Roastery Subscription coffee. 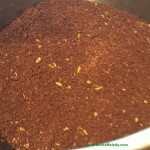 The Roastery has a small amount of it right now, not sold via subscription. When it’s gone, it’s gone. It was roasted on February 14th. 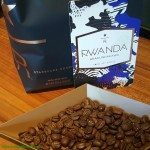 A Roastery subscription is a way to get exclusive, wonderful, small-lot coffee delivered to your doorstep within days of roasting. 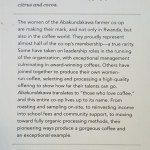 The long word “Abakundakawa” below the word Rwanda means “for the love of coffee.” The cooperative growing this coffee is comprised of mostly widowed women, having lost husbands in war. 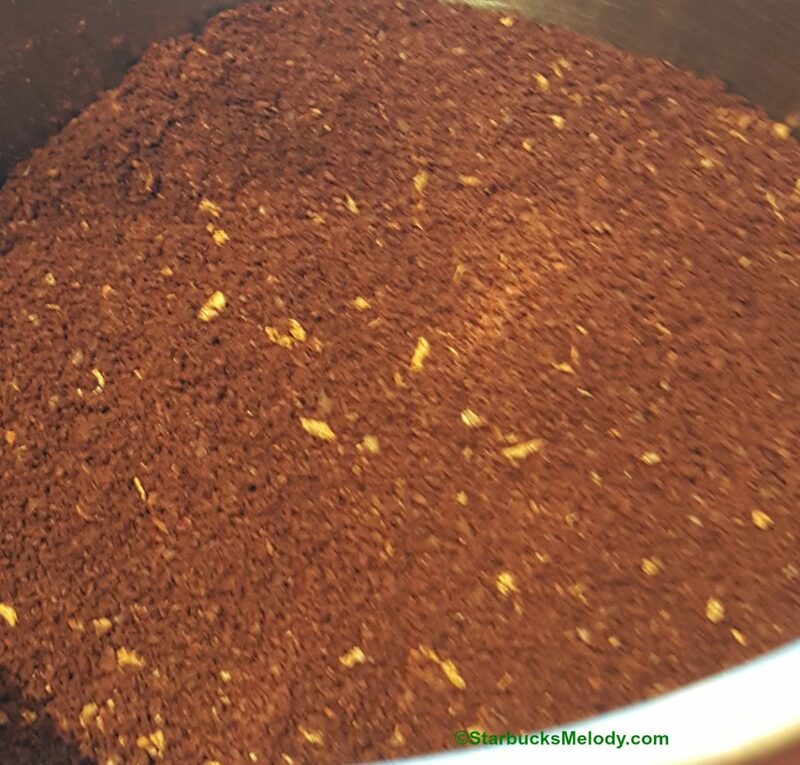 The coffee itself is a light to medium roast profile (based on the way it looks ground and looking at the whole bean coffee). 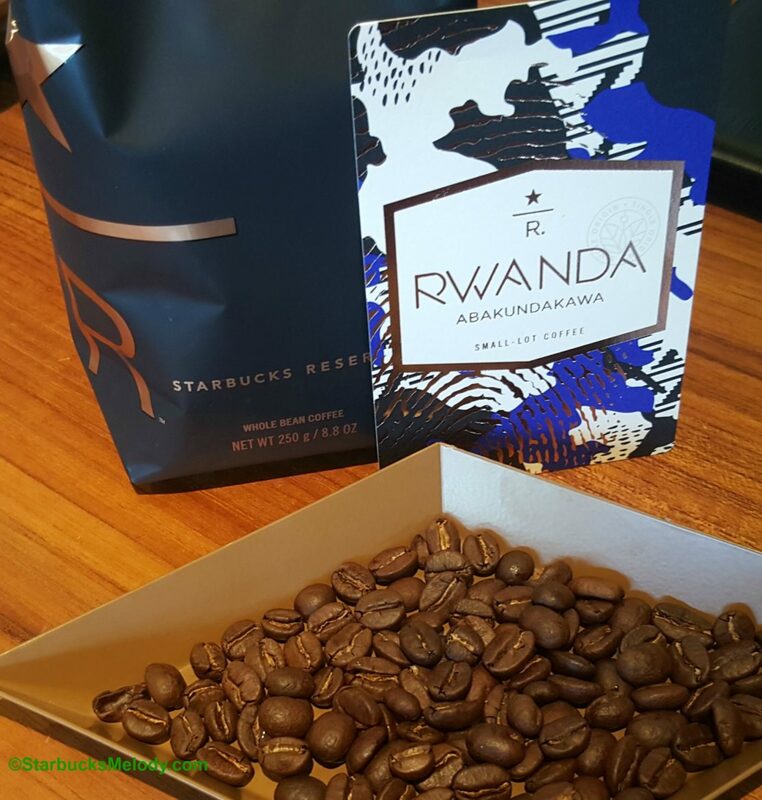 It’s a bright coffee from start to finish with caramel and grapefruit flavor notes. 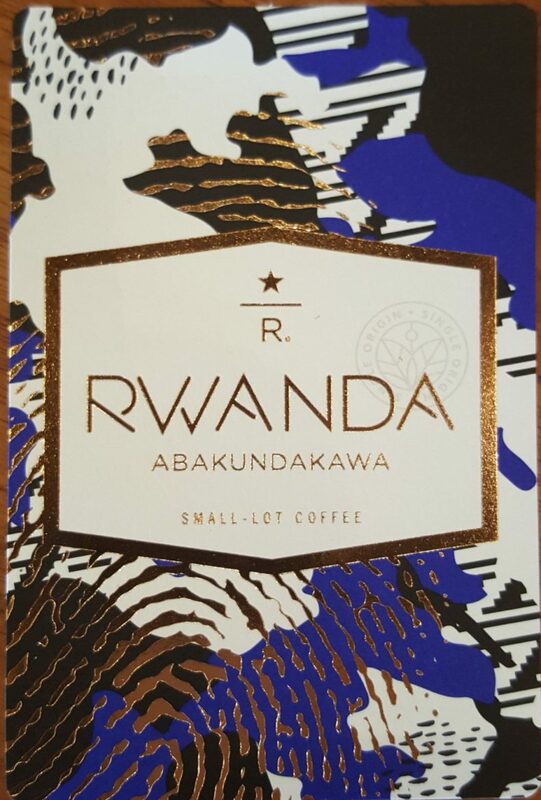 The card’s design is inspired by a topographic map of the country with an overlay of traditional Rwandan textile pattern. The over-layed gold fingerprint is someone’s actual fingerprint! 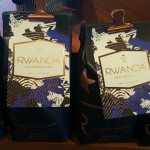 I tried the coffee at the Roastery. Roastery partner James was sampling it prepared via a pour over. Delicious coffee. It does have a light body, and it’s flavor is almost a bit like a black-tea-caramelly-grapefruity-tea. I bought a bag of it and I might experiment with it as a cold brew or iced coffee! I know almost nothing about this coffee, but I saw these burlap sacks of an unroasted green Colombian coffee near at the Roastery’s “green loading pit” this morning, so I inquired a bit. 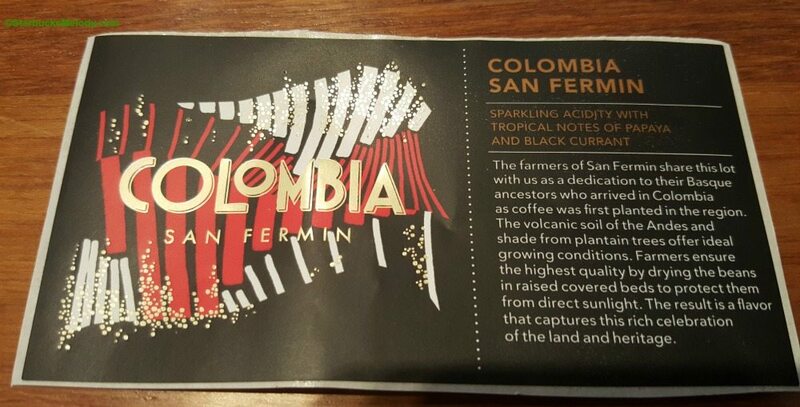 I didn’t find out too much, but learned that it was roasted for a shipment to the China-Asia-Pacific Starbucks markets. 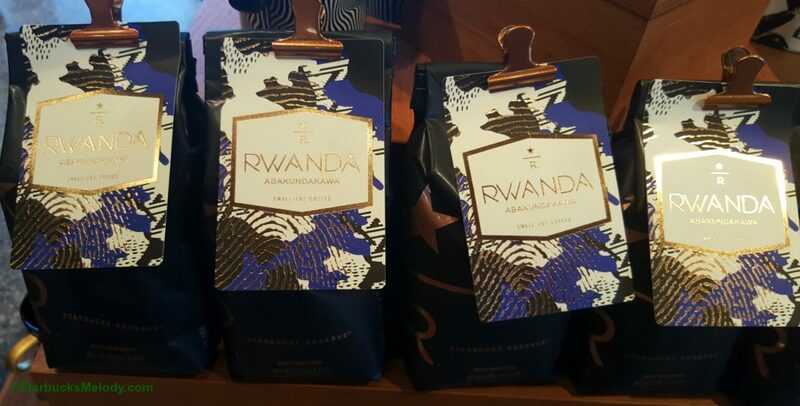 I love the coffee bags! I’d love to have a bag that has the Star/R symbol on it. 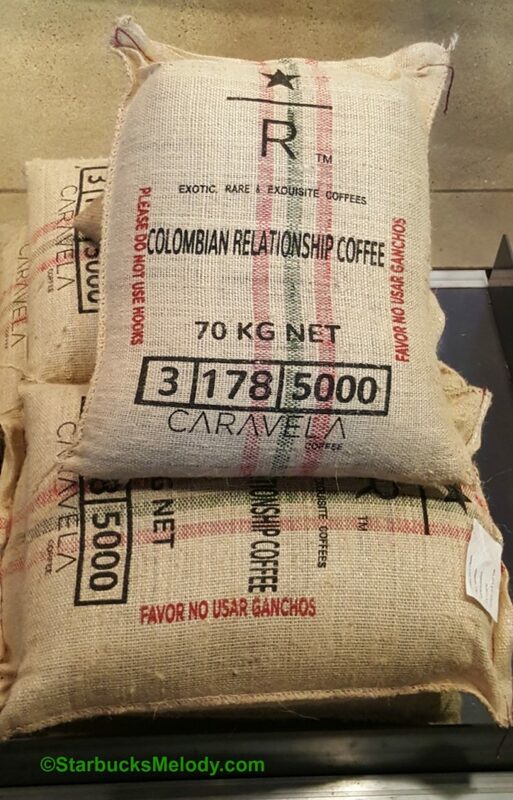 Unfortunately, there’s no way for me to get one, but I’d give my right arm for one of these very-fly burlap coffee sacks. While I don’t have much info, thought it was worth sharing! I can’t be the only one who would want one of those burlap sacks! 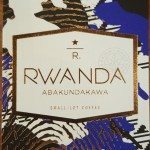 If you want more just coffee information only, visit ExploreStarbucksReserve.com – please subscribe. Thank you for the background of this Rwanda. 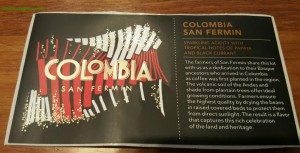 I love having a better understanding of where the coffee comes from and having an insight about the people who helped make it. Why the change in the bag to one without any colorful label? Don’t care for this change at all. Put a few different bean bags side-by-side and there’s no way to know what’s what. I know, I know Patrick. I don’t like having all the packaging being just plain, black bags. It’s not customer friendly. When the customer takes the coffee home and has several bags, they’ll all look the same.